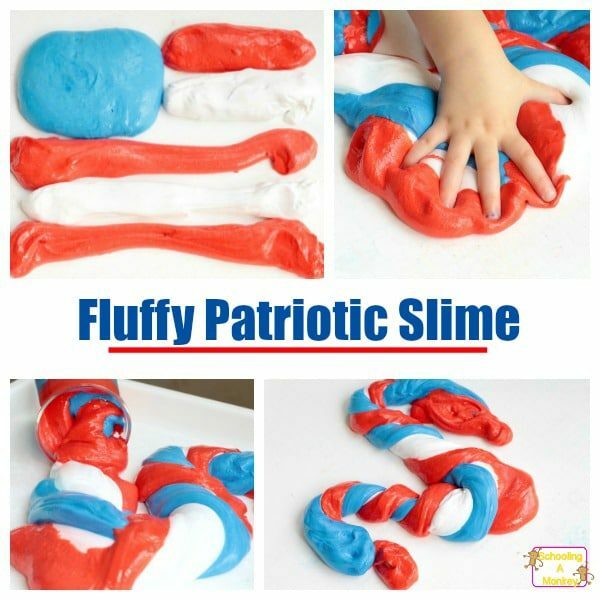 Fluffy Patriotic Slime for Red White and Blue Fun! I’ve always been particularly fond of the summer holidays. 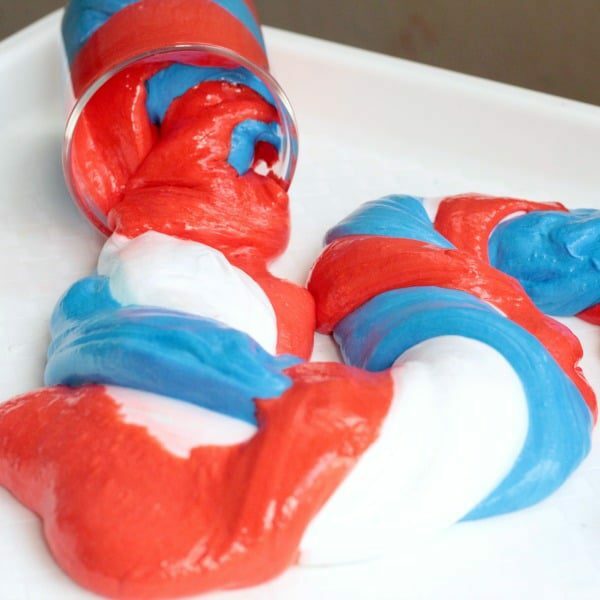 Perhaps it is because they take place when school is out, but when I see the bright red, white, and blue colors of Memorial Day, the fourth of July, or any other time America is celebrated, I get happy inside and want to make fluffy patriotic slime. For this slime recipe, we decided to channel that happiness into slime form. 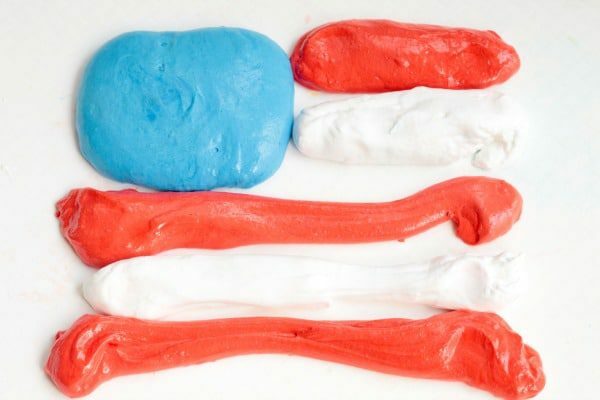 Nothing is more fun than slime, and our fluffy slime recipe was such a hit, we thought we’d make a fluffy patriotic slime recipe for all the big red, white, and blue holidays coming up! 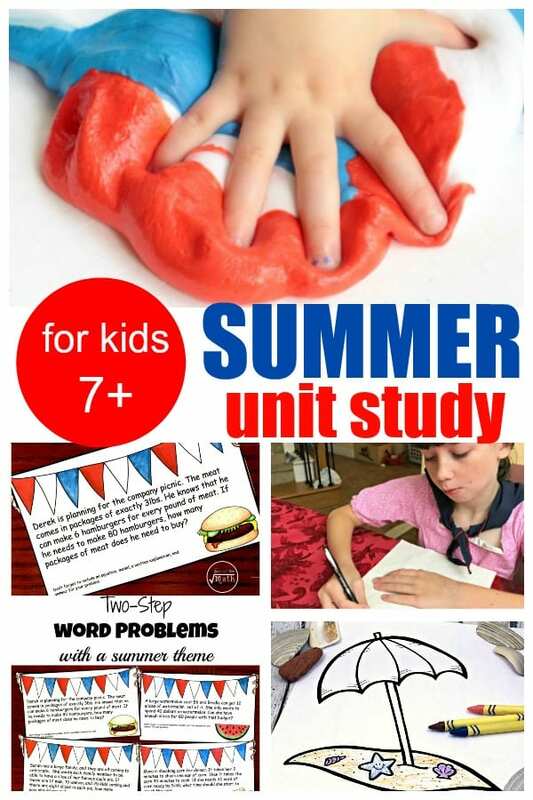 Use the ideas at the end of the post to build a complete patriotic thematic unit! Not American? Don’t worry! 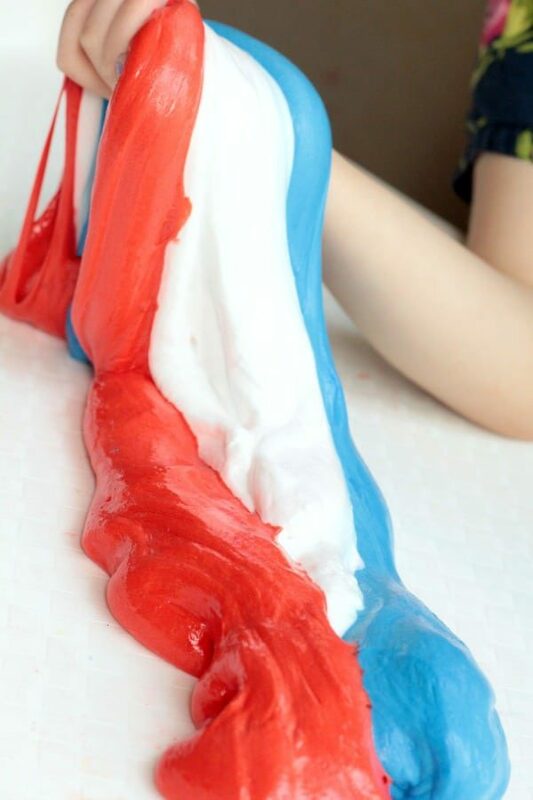 You can use this same slime recipe for any country using red, white, and blue in your colors, which includes the UK, France, Australia, Norway, Sweden, and lots more! 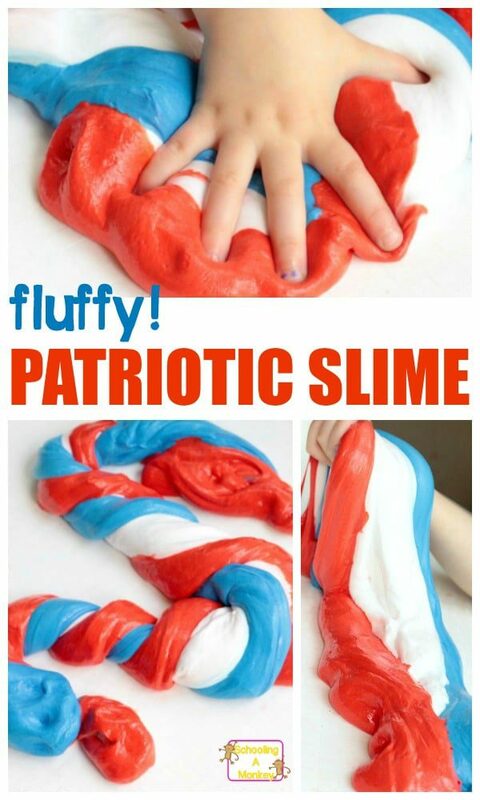 Read on to see how to make the very best fluffy patriotic slime! And don’t forget to try our other fluffy slime recipes, apple fluffy slime, ice cream fluffy slime, and basic fluffy slime! Slime is made when boron mixes with the polymer chains in the glue, creating strong, but flexible bonds between the molecules. When you add shaving cream into the mix, you get a whole new element of fluffy slime fun! 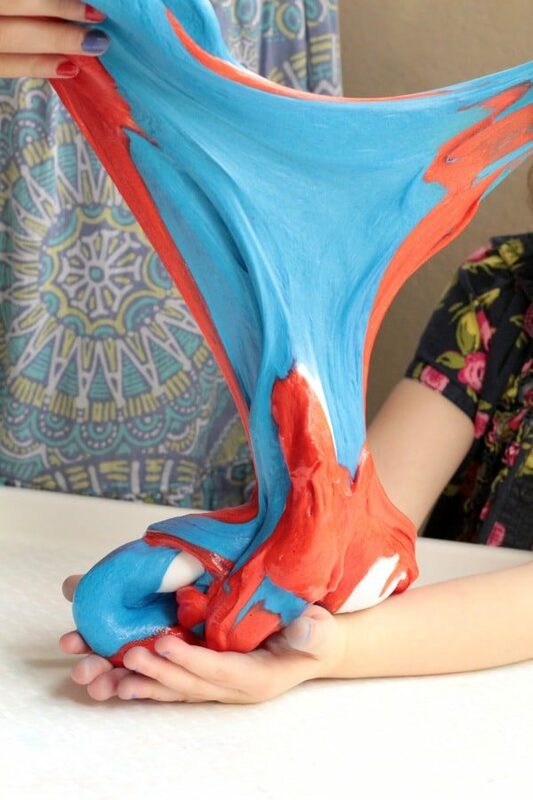 The shaving cream gives the slime a puffy texture, which is so fun to squeeze and stretch. My kids prefer fluffy slime to any other slime recipe! 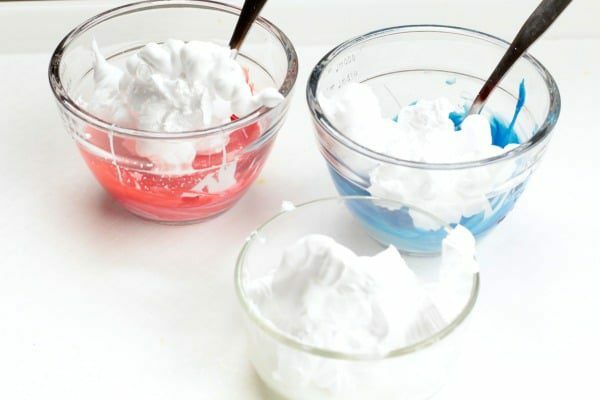 Since fluffy slime does contain borax, if you have a sensitivity to it, you may want to try our baking soda slime instead. If this is your first time making slime, you should follow along with our post on slime troubleshooting. Fluffy slime is not the easiest slime to make. 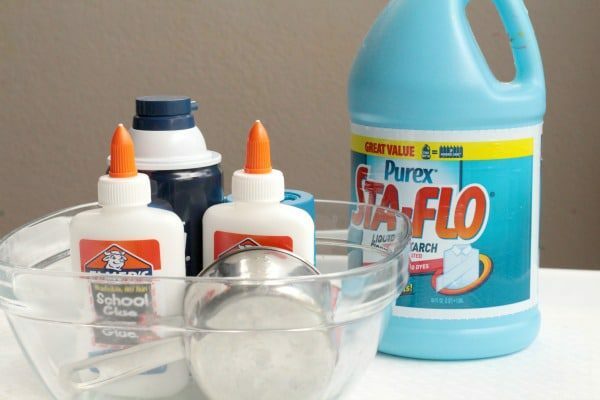 Liquid laundry starch slime made with clear glue is the easiest slime recipe. 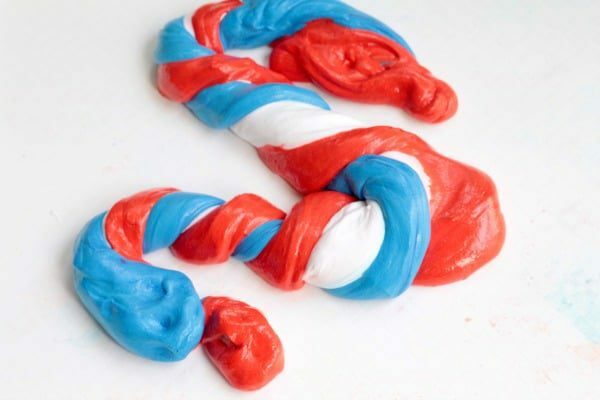 When you add in shaving cream, the chemical balance is a little different and the tendency will be for the slime to be a bit stringy at first. There are ways to get around this, which I discuss in my slime troubleshooting post, but in general, if you work through the stringiness and your ratios are correct (as outlined below), then you will end up with perfectly fluffy slime and you won’t have to throw it out. 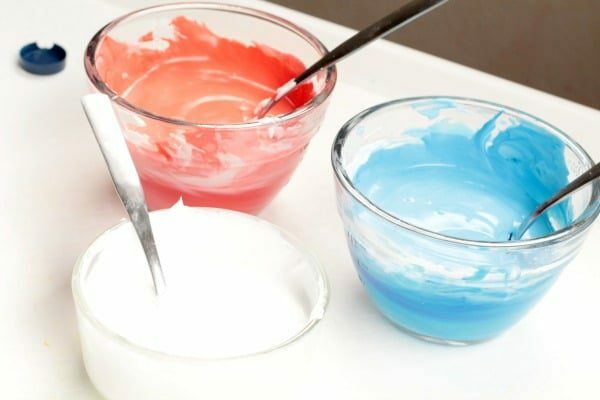 Follow these directions and you’ll have the best fluffy patriotic slime ever! 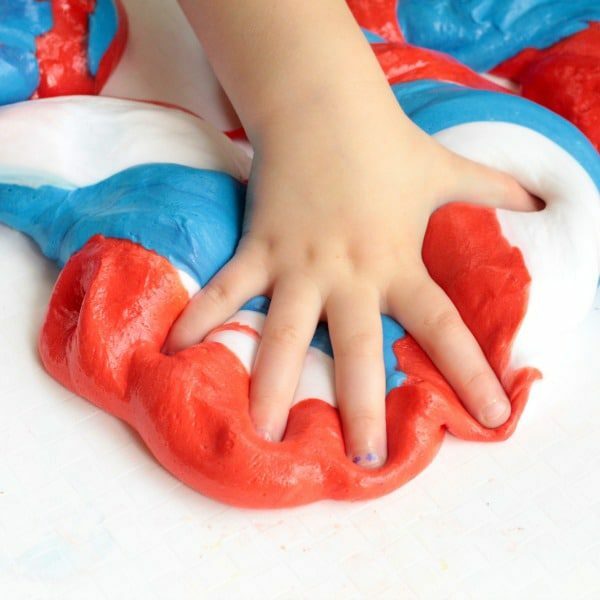 How to Make Fluffy Patriotic Slime for Red White and Blue Fun! 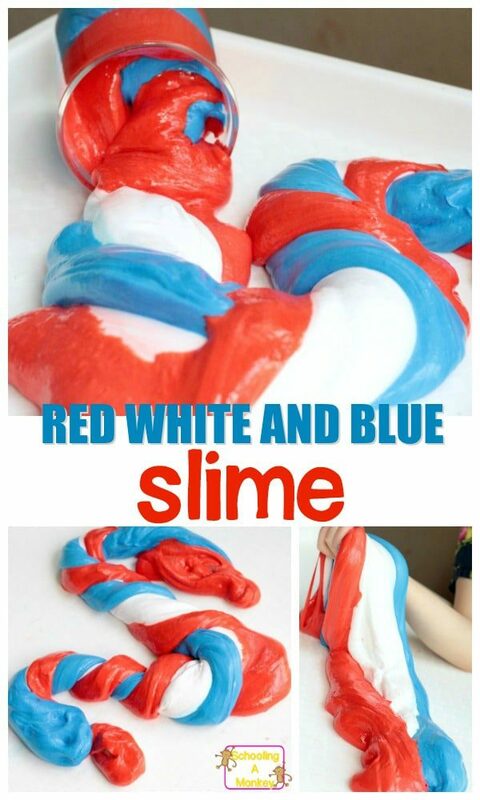 It’s so simple to make fluffy, patriotic slime! Safety Note: More people report itchy, dry, or red skin after making fluffy slime. If you notice an adverse reaction to the slime, stop use right away. I recommend only making this version of slime with older kids, and making a kid-safe slime with younger kids. Washing your hands after handling slime and not making this version too often will help prevent any allergic reactions. 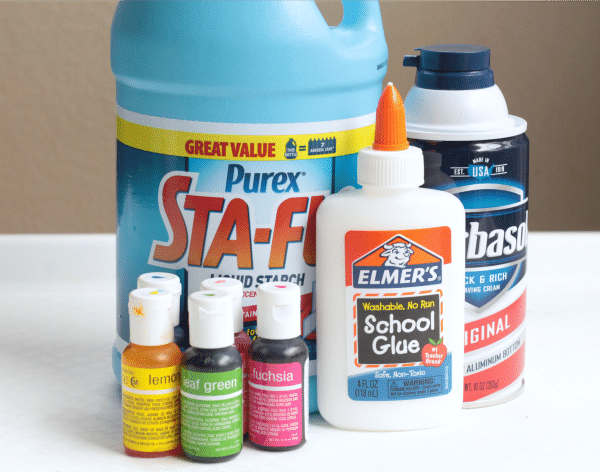 Pour 1/2 a cup of white shaving cream and 1 bottle of Elmer’s glue into three containers. 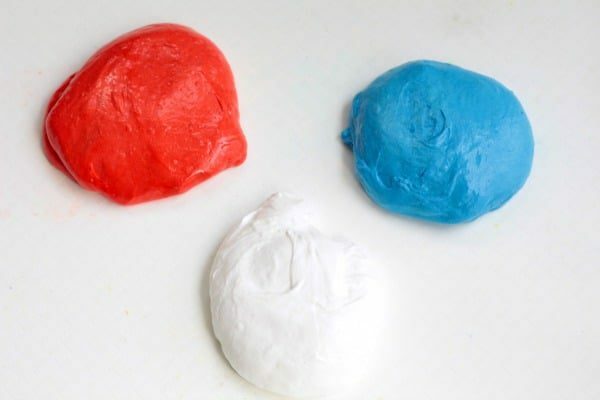 Add red dye to one, and blue to another, leaving the third white (use this brand of food coloring for vivid colors). Stir. Pour 1/2 a cup of laundry starch into each container. Stir with a fork. At first, the slime will look like a goopy mess, but don’t give up. If you keep stirring, the slime will suddenly turn into perfectly puffy slime. The more you handle the slime, the stretchier and less sticky it will get. 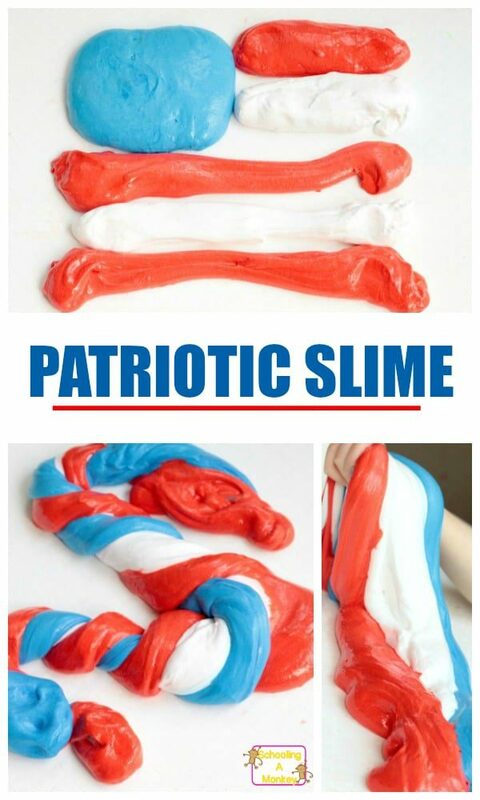 Try making a flag from your slime! Remember, once you mix the colors, you can’t un-mix them, so don’t mix the colors until you are ready to blend. The more you handle the slime, the more marbled the slime will appear. Eventually, the slime will turn a purple color, but there is lots to do with it before that happens. Twist it together for stretchy fun! Pull it apart and watch it stretch. Press your hands into the fluffy goodness. 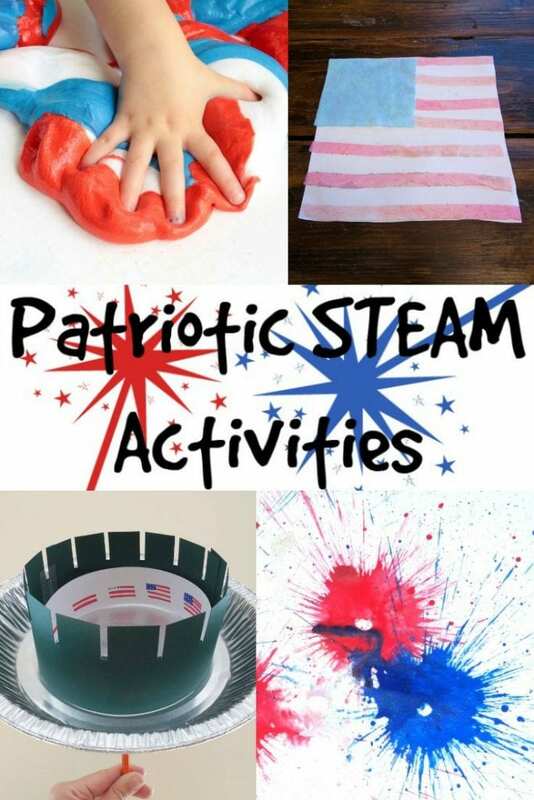 Round out your festivities with these patriotic activities perfect for a July 4th unit study!